Handmade baby and toddler clothing, vintage inspired with a modern flair. Do you have a Magic lover in your life? This little outfit is perfect give for your next baby shower, birthday party or even Halloween. The cuteness of my popular ruffle diaper covers complete with a coordinating onesie. Save when you buy them together. 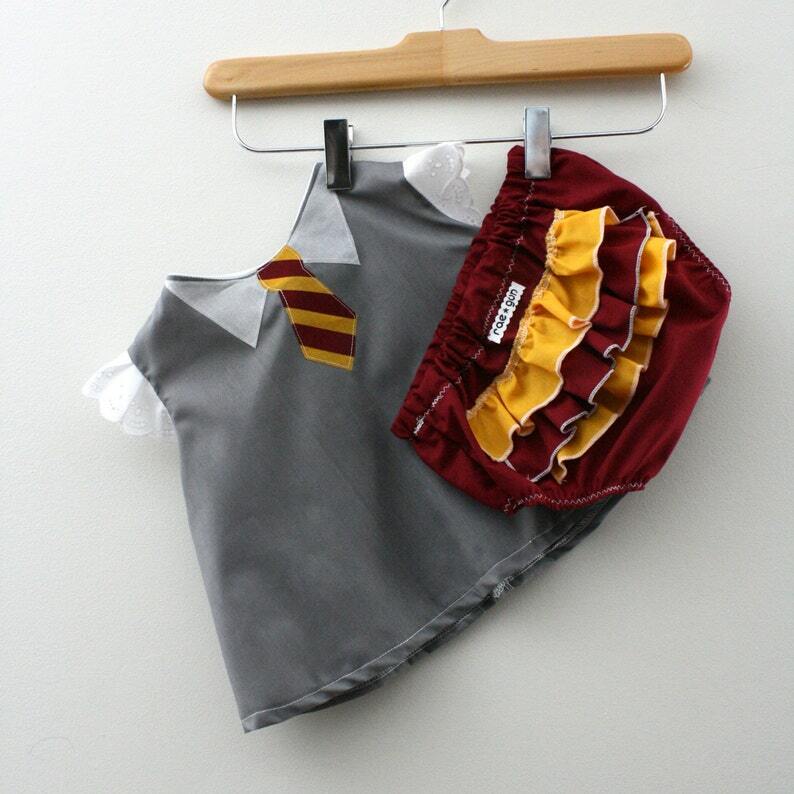 I also sell a Wizard student onesie set as an optional add on. I also sell a boy version of the onesie set without ruffles see my other shop listings or message me for help with that. Please check the drop down menu for size and color availability at this time. Not a maroon and gold family I can do other house colors too just state your preference in the notes to sellers section when you check out to change the colors. The tunic is sewn half way up the back and fastens at the top with a button more like a traditional top while the swing top closes at the top with a single button and then is full open in the back. Besides that they are identical. You can see the difference on the 5th picture. Please allow 2-3 weeks for our order to be made before shipping. If you need it to be mailed before the full turnaround time please contact me prior to ordering to make sure I can accommodate your schedule. Very helpful. Great customer service. Thank you. Oh my how cute! Giving to special friend on the occasion of her first baby. I cannot wait to see the shock in her eyes. I really love the Ravenclaw robe I got my daughter and I’m happy with the actual product. However, I’m not too happy with the lack of communication. I had messaged the owner around Nov./Dec. about my daughters bottoms not fitting even though she worn it only once. I had bought it when I was expecting. She contacted me almost a month later. I let it go because my daughters birthday party had passed and I made it work. I decided to then purchase a different size much bigger that way she can wear it for longer. I had asked if a ravenclaw robe would be available and again no response. I had sent alteast five messages. I was frustrated because I’m a HUGE Harry Potter fan, both my daughters are named after my favorite characters so these robes would be perfect for them. As soon as i purchased my items, I received it within a week.